recently, i went to the Met and saw a fascinating exhibit. while strolling through the American Wing, i saw out of the corner of my eye a tidy, tiny closet. i had to do a double take because it was hiding in plain sight in the middle of a pass-through corridor. the exhibit – titled 'Sara Berman's Closet' – was striking in its austerity, especially given its proximity to a neighboring exhibit space showcasing the elaborate, turn-of-the-century dressing rooms of a socialite and her daughters. one of the most striking aspects of Sara Berman's closet, of course, is the very modern minimalism of it all. the perfectly folded piles of clothing, the absence of clutter, the all-white palette of her wardrobe in her later years – it all references many cultural notes in our spark-joy-infused times. the aesthetic was equal parts The Row and Uniqlo. it also got me thinking about one of the main questions that inspired this blog, nearly eight years ago – how does one develop a personal style? what do the clothes we wear say about who we are? i really admire Ms. Berman's focus and clarity. 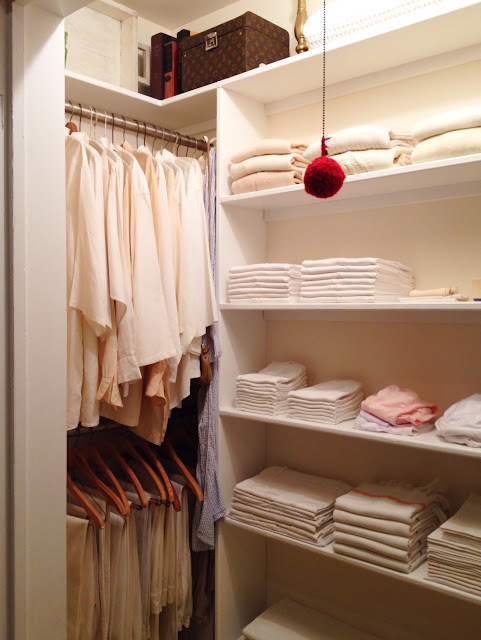 however, i don't think i could adhere solely to a tiny, all-white wardrobe. i have too many meaningful objects and stories in the pieces in my closet to be able to pare it down to such an extreme. for those of us who aspire to have a wardrobe that's thoughtfully edited, i think it's important to acknowledge the tension between the desire for minimalism and the excess of life. we don't have to stick to an artificial, highly theoretical formula of 20, 30, or 50 wardrobe items. seasonal decluttering is great, but finding a place for a special, sentimental piece is just as important. it occurred to me that sometimes i wake up and feel like a monochromatic minimalist, and other days i feel like channeling Iris Apfel. i think i'm okay with both. what do you think? how has your style evolved? You know...I've gone through many of these extremes (super minimal and super maximal, very pared down and borderline hoarding) and am now at a place in the middle. It's probably because I've experimented a ton and settled into myself and my style but I'm good with where I am for the most part. I do tend to lean toward having a more lean closet, but that's because ideally I'd like to wash everything in one load (LOL). I agree with you that we need to make room for special pieces. While I'm frequently selling off things that aren't cut out for my lifestyle, there are others that I refuse to get rid of even if I rarely wear them. i have to say that i'm definitely on the more extreme end of the bell curve, here--towards maximalist. sorry, been studying biostatistics! HA. i think a lot of my wardrobe is the "special" piece with very few basics that serve as a base for something bold, patterned, or standout. i used to think that i should be more minimalist with my style, but it's just not me. i've settled into being ok with owning an entirely sequined bomber jacket and knowing i'll wear it more than most. the basics are cool and i replace them when they get worn out. even in my maximalism, i know the value of editing. and i think culling pieces that don't feel special or in use still has a place in my process, though there's nothing pared down about my wardrobe. frankly, i consider myself to be a very decisional and deliberate person, but with my wardrobe i want to express unpredictability when it suits me. nothing to apologize for! maximalism with an edited eye is precisely why i find Iris Apfel so inspiring. A mostly light colored wardrobe is not for me - how many times have I looked down to find I've spilled coffee on myself! I read a very interesting article about how although there's nothing wrong with minimalism per se, the way the term is being used now in terms of wellness, wardrobe, living, etc, is pretentious and elitist. Of course now I can't find the article, but The Guardian ran a similar opinion piece - https://www.theguardian.com/lifeandstyle/2017/mar/04/minimalism-conspicuous-consumption-class . I can see their point - I mean, how much would a capsule wardrobe cost at some place like The Line? Probably more than an entire year's salary! I don't much like the idea of a capsule wardrobe full of classic, basic clothing. I got into fashion from admiring the CdG universe and designers like McQueen, after all. I prefer the term 'edited' wardrobe, and it's something I've gotten better at as I grow older. It's also something that needs constant tending - altering to fit, mending things, replacing yellowing white shirts - unlike some mystical unicorn wardrobe where you will never need to buy another thing again. I remember there was a time I didn't even wear half my wardrobe, mostly because I couldn't even see the other half! Now that I know my style, like InnyVinny, my closet is much slimmer but almost everything gets worn regularly... except for that little black dress that's supposed to be a wardrobe basic which I've never worn! yes i've read that critique of minimalism as well. it can be a very socioeconomically based 'lifestyle choice' in many ways. i find the idea of the capsule useful to refer to but not as an end-all. I don't know what it is with old ladies and white pants. lol! The biggest influence in my style is work. I remember when my style was more "American classic" and now has evolved more into the Rick Owens type of aesthetic. There are pieces in my wardrobe that I didn't get to wear for years that are in heavy rotation now and vice versa. I also am more realistic about what is relevant to my life than 10 years ago. I agree with Koko about an edited wardrobe and growing up with avant-garde designers: McQueen, Galliano, etc... I'm not that into super simple clothing. I don't feel like myself. I like them as base layers. But I get bored, so I like pieces with some extra oomph even if its solid black. ha! is this a thing? i will have to keep an eye out. i love your RO aesthetic. you wear it all so well! I had my magpie, Iris Apfel moments, but they were rare and I ended up losing interest in these pieces after a short while, and gave them away. After a while, I realised that I like richness and texture in materials, rather than print or shine. And so my eye became used to going straight for pieces like that, instead of the more colourful items. I think it's easy for me to choose a classic-ish, pared-down palette and aesthetic because it's what I naturally gravitate to (I mean, my all-time fave inspo pix is the late CBK in a black top and jeans, and this hasn't changed since I was 16). So even my occasional foray into prints now are almost all navy and white. I'm definitely not a minimalist in the numerical sense though. In fact, when I was going stir-crazy (medical leave) at home, I did an inventory of my wardrobe and I'm somewhere around 200 pieces of clothing (including shoes, bags, activewear, and belts etc). I don't feel any real obligation to pare this down even though there are some truly white elephants in there (jackets I'll never wear because it's so hot in SG for example). But it made me feel like being a bit more rigorous about buying new stuff - so much good stuff in my wardrobe that needs more airing. I want to wear all my stuff more regularly before I buy more stuff. From an environmental point of view, consuming less is important to me as well.